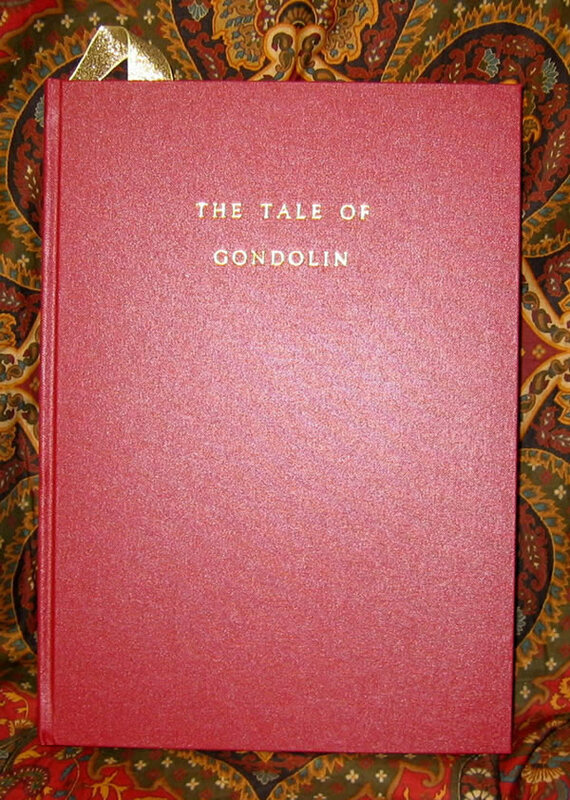 Tale of Gondolin - with custom clamshell case - $3000.00 Assembled and revised by Alexander Lewis from the "Unfinished Tales", "The Book of Lost Tales" volume two, and "The Silmarillion" by J.R.R. Tolkien and Christopher Tolkien. Illuminated and illustrated by Ruth Lacon. Assembled and revised by Alexander Lewis from the "Unfinished Tales", "The Book of Lost Tales" volume two, and "The Silmarillion" by J.R.R. Tolkien and Christopher Tolkien. Illuminated and illustrated by Ruth Lacon. The Tale of Gondolin - Assembled and revised by Alexander Lewis from the "Unfinished Tales", "The Book of Lost Tales" volume two, and "The Silmarillion" by J.R.R. Tolkien and Christopher Tolkien. Illuminated and illustrated by Ruth Lacon. Limited to fifty copies, this is Number 34 of 50 signed by the editor Alexander Lewis, and the illustrator Ruth Lacon. 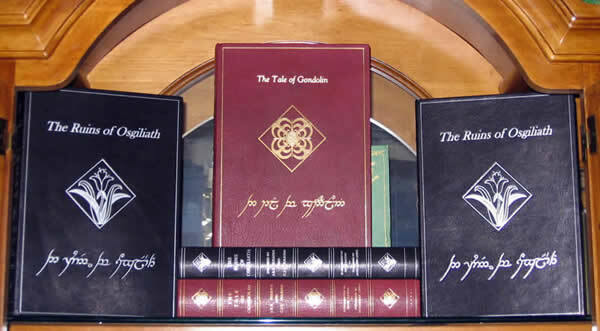 Preface to the assembled Tale of Gondolin, "The Tale of Gondolin is drawn from the various references to Turgon and his life throughout the Silmarillion, and sewn into the fabric of what was drawn from Unfinished Tales the chapter 'Of Tuor and his coming to Gondolin' which is reproduced as printed therein with little alteration, though where necessary, some of the notes to the Unfinished Tales were worked into the narrative where it was thought to clarify the text." "The Unfinished Tale was written by J.R.R. Tolkien in 1951 and left unaccountably unfinished; it would have given in fine detail all that appears as the brief chapter 23 of the Silmarillion, yet tragically it only reaches Tuor's entry into the Hidden City and it goes no further." 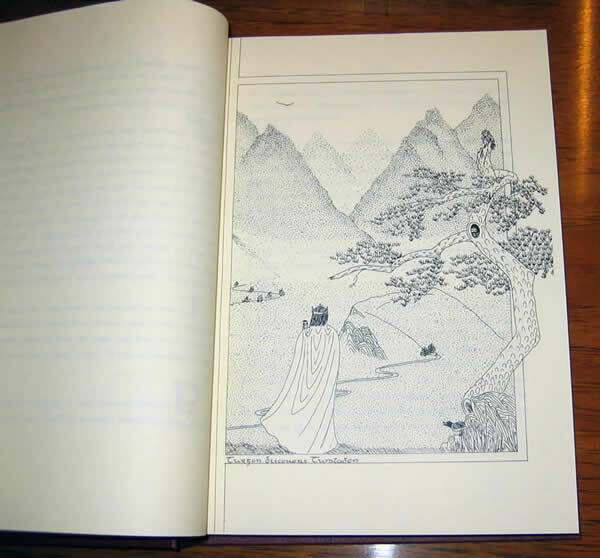 "The rest of the Tale is therefore drawn from the account given in the Book of Lost Tales Volume Two. 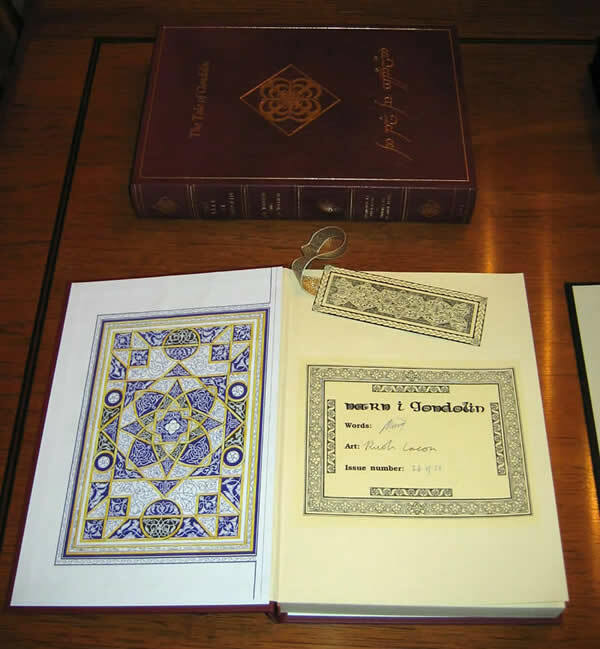 This account was first written in about 1916, or slightly later, and amended in 1920 for presentation as a paper to the Essay Club of Exeter College, Oxford, and then used as a basis for what appears in the Silmarillion (which was written between 1926 and 1930)." 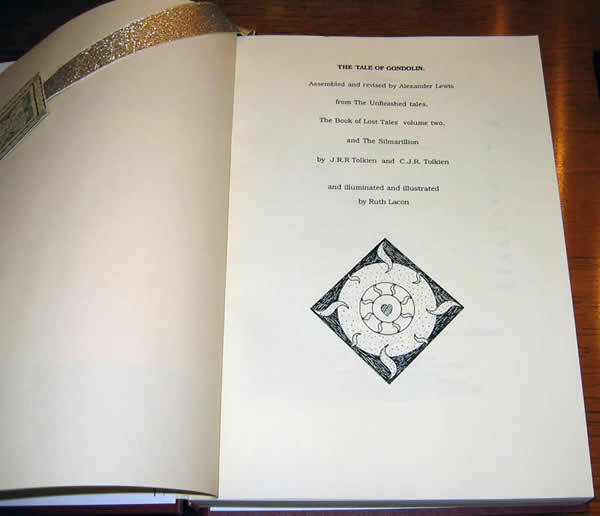 The first proof copies of this work were produced in 1987. The author refers to these books as the 'First Edition'. 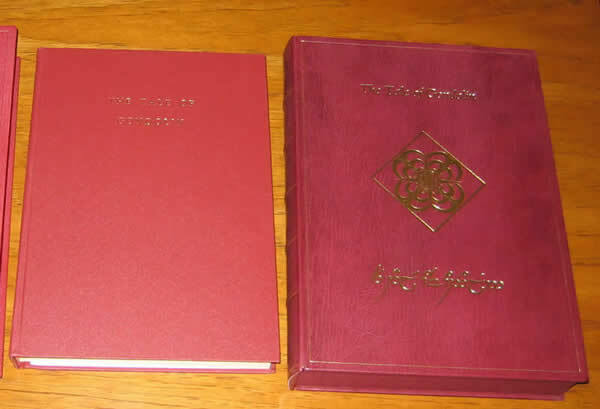 Only two copies were made...one red, leatherbound copy that was presented to Priscilla Tolkien and one clothbound copy for the authors own reference. Both books were A5 size and neither copies were signed or illustrated. The idea for an illustrated and illuminated book, to put the story into - in the style of medieval illuminated books, such as Lindisfarne Gospels etc. - came later on. The designs were presented to Priscilla Tolkien and we were given permission to produce "The Tale of Gondolin" as it now is. "The first copies of the Limited Edition were produced in 1994 & 1995. Number One went to Priscilla Tolkien as a thank you - and other copies went to either Tolkien Society members of members of the Mythopoeic Society in the USA. Demand for the copies diminished and production was halted with only 28 of the 50 copies complete. With the renewed interest in The Lord of the Rings from the Peter Jackson interpretation of the story....we decided to complete the print run and issue the final remaining copies in 2004." 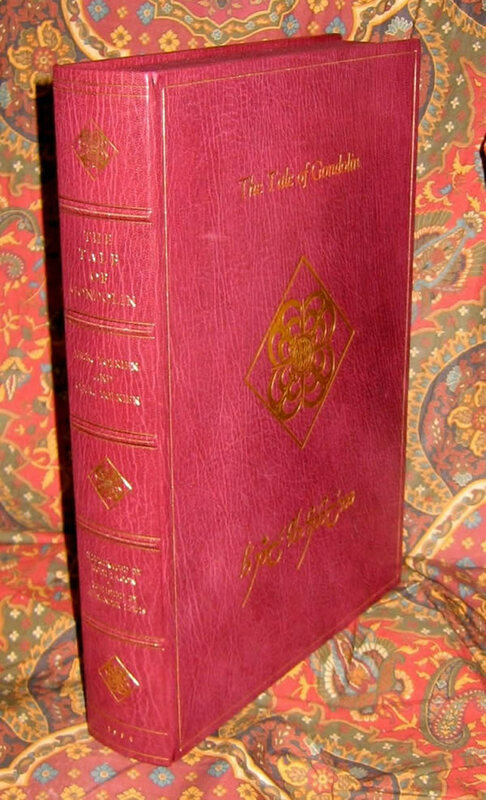 This copy is now housed in a custom designed, full Burgundy leather clamshell case, with gilt stamped "Tengwar" title, heraldic emblem, raised bands, gilt ruled edges, nothing spared to protect and show off this rare edition.